New York is the art capital of the world, with numerous artworks that can be found in art museums, galleries, parks, cafes, and even on the streets. You can enjoy art simply everywhere… Just look around, and you are sure to find something special you will love. However, if you are looking for high art in NYC, you should know where to go. For example, at Fine Art Shippers, we highly recommend visiting Gagosian, David Zwirner, Acquavella, Gladstone Gallery, and Luhring Augustine because they are among the best galleries focused on high art in NYC. As for the museums, you should definitely visit the renowned Solomon R. Guggenheim Museum and see its amazing collection of art with your own eyes! First of all, it should be noted that the Solomon R. Guggenheim Museum in New York is an important piece of art by itself. The fact is that the Museum is housed in the iconic Frank Lloyd Wright’s building that is one of the most important architectural structures of the 20th century. 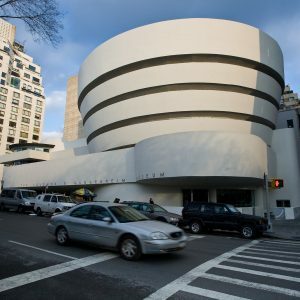 Secondly, the Solomon R. Guggenheim Museum is known throughout the world for its outstanding collection that features the best examples of high art in NYC, including true masterpieces of Impressionist, Post-Impressionist, Modern, and Contemporary Art. Among the exhibits are works by such masters as Edouard Manet, Paul Cezanne, Amedeo Modigliani, Marc Chagall, Wassily Kandinsky, Pablo Picasso, Constantin Brancusi, and many other prominent artists. This museum is indeed worth visiting by all connoisseurs of high-end art!